Former ABC group CEO Solly Mokoetle’s departure package was R3.4 million. The SABC board released the figure yesterday after the intervention of Communications Minister Roy Padayachie. Padayachie had a meeting with the board yesterday and told it to make the details public “in the interests of transparency and accountable governance”. Mokoetle and the SABC jointly announced his decision to resign on Wednesday, but refused to divulge how much he’d received, saying it had been agreed this would be confidential. While Mokoetle denied receiving a golden handshake, the failure to provide any details led to wild speculation that he’d pocketed as much as R30m – a sum categorically denied. Opposition parties, meanwhile criticised the secrecy, arguing that the SABC was a public-funded institution. SABC spokesman Kaizer Kganyago yesterday said Mokoetle had been paid R3.4 million. While Mokoetle’s contract had four years left to run, the payment amounts to one year’s salary, as well as leave and pension benefits. “While wanting to respect the confidentiality of the settlement, it is in the interests of transparency and to put an end to negative and incorrect media reports that the board has decided to make the disclosure,” said Kganyago. Approached for comment, Mokoetle said as part of the agreement between him and the SABC, he could not discuss the matter. During his meeting with the SABC board yesterday Padayachie urged swift action in appointing a new CEO. The embattled public broadcaster has had its chief financial officer, Robin Nicholson, acting in the position since Mokoetle was suspended last August. Disciplinary proceedings against Mokoetle – for alleged breach of contract and failure to craft a turnaround strategy – fall away with his resignation, averting what could have been a long, costly legal battle. Mokoetle told the Saturday Star this week the past six months had taken a “strenuous toll” on him and his family. His relationship with the SABC board had broken down “irreconcilably”, but the parting of the ways was “amicable”. However, an SABC board member, who asked not to be named, said arriving at a settlement with Mokoetle had not been plain sailing. “Solly wanted R1.5m extra for his legal fees. We told him that was not going to happen,” the source said. 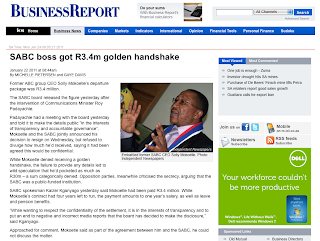 Former Group CEO Dali Mpofu received a golden handshake of around R14 m.
Mokoetle’s suspension came just eight months after his appointment.